Going out with a big group shouldn't be anything but fun. And once you’re settled in with plates of food in front of you and drinks flowing, it usually is. But planning an outing for a sizable group can be a straight-up hassle. Instead of spending precious time calling restaurants and sorting through details when you could be, you know, bar-hopping, just save this link and thank us later. For one thing, it comes with owner Diane Coohill, a Denver event planner extraordinaire. Let her take care of the details at this spot, which has hosted as many as 600 people. You don't need to have hundreds in your group, though. It also offers tons of other options for groups of all sizes, including prix-fixe menus, buffets, a private dining room, and a hard-to-beat chef's table experience. This more-than-14,000sqft restaurant typically has the space to accommodate your group even if it's a last-minute outing. You can also just rent out the whole thing with no room fee -- only food and beverage minimums. Bocce courts are reservable, too. How to reserve: Book online for groups of all sizes. While the main part of the restaurant can only fit groups of up to eight, it's the wine cellar below that's the real draw for special occasions. Exposed brick, flora and fauna everywhere… and good food. That’s there, too. 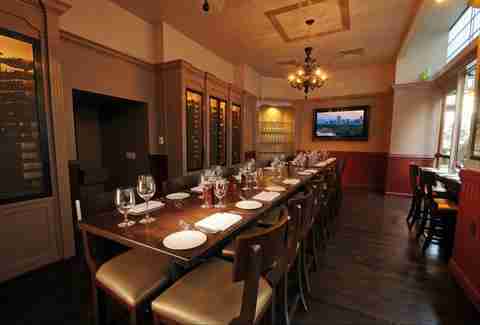 How to reserve: Parties of eight to 15 can book the cellar online or by calling the restaurant at 303.777.3505. Parties of up to 10 are usually no problem during regular service. For larger groups, you can rent out the private dining room (fits up to 20), or buy out the mezzanine level (fits 46 for a sit-down dinner). 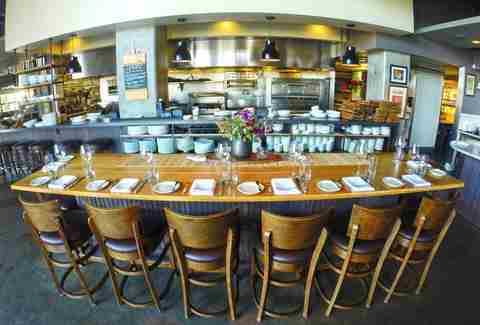 How to reserve: info@lenadenver.com or 720.550.7267. This family-owned Italian restaurant is the epitome of old-school hospitality. On its menu you’ll find pasta, seafood, Sicilian specialities, and of course, table-side flambé. Request one of the tables upstairs for a more private experience. 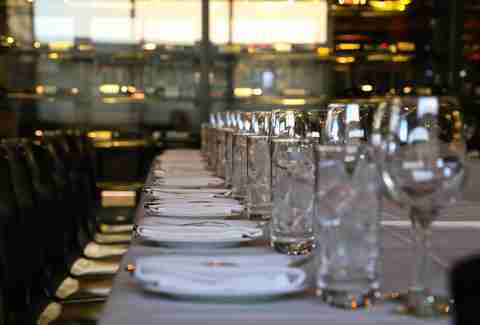 How to reserve: Groups up to 12 can book online; for larger parties or special requests, call 303.318.0102. Another Italian classic, food here is served family-style -- and has been since 1994 -- so come ready to share. How to reserve: Book online for groups up to eight, or call 303.777.6443. Bowling, darts, shuffleboard, ping pong, arcade games… there's a lot to keep your group entertained here, and they're seasoned pros at events of all sizes. How to reserve: Book online (groups up to 10) or call 303.765.2695. Yes, it's in a hotel; no, this is not your standard hotel fare. There are nine different spaces available for private dining and events, so you're sure to find an option that's right for your group. How to reserve: There is a form for large-event requests, and groups up to 19 to can book online or call 303.296.3525. Another hotel eatery, The Nickel's carefully crafted cuisine (and amazing charcuterie program) make it ideal for any night out. But it also has impeccable areas available for big groups -- including the wine cellar. How to reserve: For private event requests, fill out this form. Groups up to 20 to can book online or call 720-889-2128. Impeccably designed, this modern steakhouse is a crowd-pleaser (and yes, it has vegetarian options too). Its three private rooms can be reserved separately, or combined for large events, and there's only a food and beverage minimum, no rental fee. 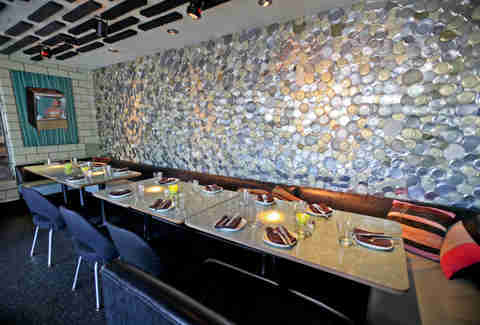 How to reserve: 303.293.8500 or email jeorgette@tag-restaurant.com for private events. You can make your get together at Range, which is located in the restored Colorado National Bank building, a memorable experience by dining in one of three bank vaults. The food is American Western, so expect a lot of lamb… and pork. This longtime favorite for mimosa-fueled brunches and fresh, locally sourced cuisine also has a private dining room that fits up to 22. The bar and lounge can also be reserved for bigger events. How to reserve: Groups up to 14 can book online. For larger groups and private events, use this form. 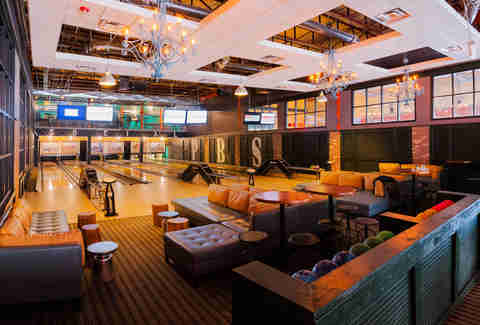 There's tons of space (its two private rooms can fit up to 100 people in each), TVs everywhere for big games, and who doesn't love burgers and beer? Serious question. 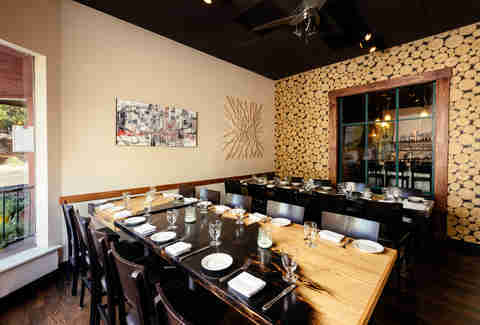 How to reserve: 720.287.4493, or use this form for private events. Two words: ping pong. It's always included when you buy out a part of the restaurant for a group (or the entire space). Ace can accommodate anywhere from 20-500 people for events, and up to 22 for regular service. For food, you’ll find Korean BBQ ribs, bao buns, and dim sum. How to reserve: Book online, or use this form for events. Its clean, fresh design is inviting, and the space is designed to handle events from 14 to 200 people with several options, including the pantry area (which includes a private outdoor space). It also specializes in Piedmontese pastas, and if you don’t know what that is, definitely go and find out. 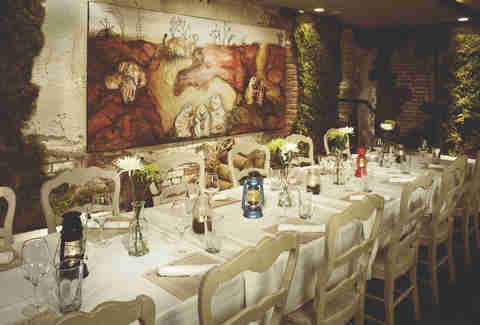 How to reserve: Groups up to 11 can book online; for larger groups, call 303.455.1400 or email info@sartos.com. 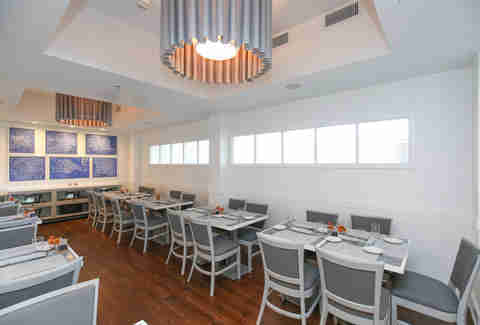 This place specializes in contemporary European cuisine, and the space is large and easily reconfigured for large groups during regular service. It has a private dining room, as well as a full restaurant buy-out option. 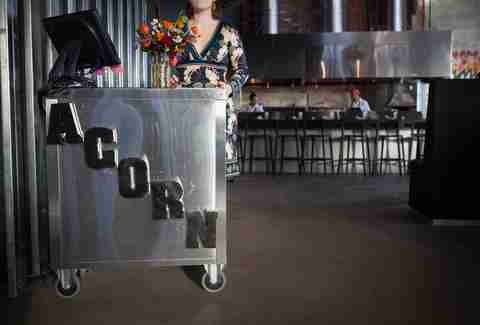 Acorn's private dining loft, know as the Bird's Nest, hovers above the rest of this bustling eatery, and can fit up to 40. Also, the cocktails have been recognized as some of the best in the nation, so come thirsty. How to reserve: Groups of up to 13 can book online for regular service in the main dining area. 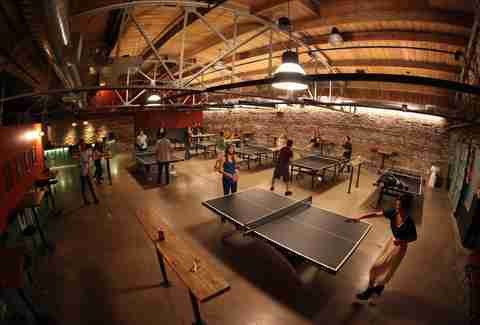 For larger groups, events, and to book the Bird's Nest, call 720.542.3721 or email events@denveracorn.com. For classic Italian fare, Luca is hard to beat. It's perfect for impressing when planning a classy get-together, and it also has a spacious private dining room and full restaurant buy-out options for those bigger shindigs. How to reserve: Groups up to 10 can book online for regular service (for larger groups, call 303.832.6600). Use this form for private events. Molly Martin is a freelance writer in Denver, Colorado who thinks all group dinners should involve ping pong. Follow her on Twitter and Instagram to see where she's dining this summer.